The balance between calcium and vitamin D is essential in mammalian development. Calbindin-D28K (CaBP-28K) and calbindin-D9K (CaBP-9K) are cytosolic vitamin D– dependent calcium-binding proteins that mediate the dynamic equilibrium of vitamin D and calcium, particularly in the absorption of intestinal calcium, in urinary calcium excretion, and in bone formation. However, the precise roles of CaBP-28K and CaBP-9K are not well understood. CaBP-9K/CaBP-28K double-knockout (KO) mice have a normal phenotype under conditions of normal dietary intake of calcium. Conversely, when given a calciumdeficient diet, these double-KO mice have greater reductions in serum calcium levels and bone length than do wild-type mice. In this review, we summarize and interpret the body of literature regarding the relationship of vitamin D and its receptor with CaBP-28K and CaBP-9K in mammals. Calcium is vital to the human body. Calcium ion homeostasis is necessary for cell membrane integrity, excitability of the musculoskeletal system, blood coagulation, secretion of neurotransmitters and hormones, and myocardial contraction [1,2]. Maintenance of the calcium balance requires the cooperation of numerous calcium transport proteins, including transient receptor potential vanilloid type 5 (TRPV5) , transient receptor potential vanilloid type 6 (TRPV6) , plasma membrane Ca2+ ATPase (PMCA) , parvalbumins (PVs) , calbindin-D9K (CaBP-9K) , calbindin-D28K (CaBP-28K), calretinin (CR) , and sodium-calcium exchanger 1 (NCX1) [9,10]. Of these, CaBP-9K and CaBP-28K are the 2 so-called vitamin D–dependent calcium-binding proteins [11,12]. In the modulation of calcium homeostasis, vitamin D, CaBP-9K, and CaBP-28K play important roles [13,14] in the absorption of intestinal calcium, in urinary calcium excretion, and in bone formation. Many reviews have addressed the vitamin D endocrine system and the mechanisms of action of vitamin D [15-18]. The human body can obtain vitamin D via photosynthesis in the skin or by dietary intake. The active form of vitamin D hormone, 1α,25-dihydroxyvitamin D3 (1,25[OH]2D3), binds and activates its receptor (VDR), a nuclear transcription factor . Vitamin D deficiency or a mutation that inactivates VDR can yield rickets and numerous extra-skeletal biologic responses, such as inhibition of progression of colon, breast, and prostate cancer cells; effects on the cardiovascular system; and protection against several autoimmune diseases, including inflammatory bowel disease and multiple sclerosis [20,21]. Supplementation of exogenous vitamin D can reverse rachitic bone to some extent. However, the dosage of vitamin D supplementation is still under debate, in part because the role of vitamin D signaling in calcium handling systems especially in bone is not understood fully. The cytoplasmic proteins CaBP-9K and CaBP-28K bind Ca2+ and are regulated by 1,25(OH)2D3. CaBP-28K first was described as a 28-kDa protein in the chicken duodenal mucosa and the rat intestinal mucosa; the protein isolated from the rat intestinal mucosa later was identified as the 9-kDa CaBP-9K [22-24]. These proteins belong to different subfamilies and share little sequence homology, but both involve the EF-hand structural motif. CaBP-28K (human gene symbol, CALB1) belongs to the CALB family of proteins and comprises 6 EFhand domains; CaBP-9K is a member of the large S100 family (human gene symbol, S100G) and is composed of 2 EF-hand domains [25-27]. The CaBP-9K and CaBP-28K genes and cDNA have been cloned by means of reverse transcription and polymerase chain reaction (RT-PCR) [28-30]. CaBP-9K has been found in a variety of tissues, including bone, uterus, placenta, intestine, kidney, and pituitary gland [31-34]. CaBP-28K has been found in bone, kidney, brain, pancreas, intestine, and teeth [35-43]. Vitamin D regulates CaBP-9K and CaBP-28K in a tissuespecific manner. In the intestine and kidney, CaBP-28K and CaBP-9K are dependent on 1,25(OH)2D3. However, CaBP-9K functions in the uterus, placenta, and lung independently of 1,25(OH)2D3 [29,44-46], and CaBP-28K is not regulated by 1,25(OH)2D3 in chick brain tissue . In enamel cells, CaBP-9K is dependent on expression of 1,25(OH)2D3, whereas CaBP-28K is not . Herein, we review data on the correlation of 1,25(OH)2D3 and VDR with CaBP-9K and CaBP-28K in the intestine, kidney, and bone to summarize our understanding of the processes of calcium absorption, excretion, and incorporation. Among mammals, the primary source of calcium absorption is dietary intake. Calcium transport in the intestine is considered to occur via 3 pathways. In the duodenum and upper jejunum, transport proceeds primarily via the transcellular pathway [48,49], which involves entry of calcium via an apical calcium channel (TRPV6 or TRPV5), CaBP-9K– facilitated translocation of calcium through the interior of an enterocyte, and basolateral extrusion of calcium by an intestinal plasma membrane pump (PMCA1b or NCX1). Another shuttling process is vesicular calcium transport, in which calcium is sequestered and moved primarily via lysosomes [50-53]. The third process is paracellular transport, which is a mode of rapid, energy-independent, concentrationdependent diffusion that takes place throughout the intestine [54,55]. In the transcellular and vesicular pathways, the regulation of calcium absorption is dependent on 1,25(OH)2D3 and requires the presence of VDR . The paracellular pathway is neither saturation nor concentration dependent; when the calcium concentration in the intestinal lumen exceeds approximately 2 to 6 mmol/L, paracellular transport is the main mode of absorption . Vitamin D and its receptor are crucial regulators of intestinal calcium absorption . Under conditions of vitamin D deficiency, mice lacking VDR have reduced intestinal calcium absorption [59-62]. With advancements in research regarding intestinal calcium absorption, the roles of CaBP-9K/CaBP-28K and 1,25(OH)2D3/VDR have evolved. CaBP-9K has been found mainly in the mammalian (eg, pig) intestine. CaBP-9K is highly expressed in the duodenum; its expression decreases gradually through the intestine and is undetectable in the distal ileum [63,64]. CaBP-9K originally was thought to cooperate with 1,25(OH)2D3/VDR in the regulation of intestinal calcium absorption. In rat intestinal tissue, the -449 and -485 regions of the 5' end of the CaBP-9K gene were found to have a vitamin D–responsive element region (VDRE) . In vitamin D– deficient, VDR-knockout (KO), or 1α-hydroxylase–KO mice, the expression of CaBP-9K in the intestine was significantly decreased, compared with controls [66-68]. Despite the presence of vitamin D, intestinal CaBP-9K mRNA and protein levels were reduced in VDR KO mice . Hence, CaBP-9K transcription is mediated by binding of VDR to the VDRE located within promoter regions. In chickens and mice, low calcium can stimulate the expression of CaBP-9K in the duodenum, and high calcium can inhibit its expression. Moreover, the influence of calcium on intestinal CaBP-9K requires the presence of VDR [69-71]. In the human intestine, investigators have determined that CaBP-9K mRNA levels increase with age, vitamin D levels decrease with age, and VDR mRNA levels do not correlate with age [72,73]. Thus, intestinal calcium absorption in humans seems not to depend on a relationship between CaBP-9K and 1,25(OH)2D3/VDR. CaBP-9K KO mice have a normal phenotype and can survive for more than 1 year ; TRPV6 and PMCA1 are upregulated in these animals, potentially to compensate for the absence of CaBP-9K [75,76]. Thus, CaBP-9K appears to have only a minor role in intestinal calcium absorption, but further clarification of this role should be sought. Few studies have addressed CaBP-28K in the intestine. Although CaBP-28K has been found in the intestine, it occurs at a much lower level than does CaBP-9K. A low calcium concentration can stimulate the expression of CaBP-28K, and elevated calcium inhibits its expression. In the chick duodenum, vitamin D–dependent CaBP-28K is localized in lysosomal vesicles. When vitamin D– deficient chicks are treated with 1,25(OH)2D3, lysosomes in the intestinal epithelial cells exhibit 1,25(OH)2D3–mediated upregulation in calcium content and CaBP-28K expression . Vitamin D has a greater stimulatory effect on calcium uptake than on calcium transport; this phenomenon may be attributed to rapid 1,25(OH)2D3–enhanced vectorial calcium absorption during lysosomal transport [52,55] (Figure 1). Calcium absorption in the intestine is complex and involves multiple pathways with numerous contributing factors, including CaBP-9K and CaBP-28K. Transcellular absorption occurs primarily in the duodenum and upper jejunum, whereas paracellular absorption may occur at any intestinal site. Vesicular calcium transport has not been characterized fully. Further research is needed to ascertain how these pathways function in series and/or in parallel to affect optimal calcium absorption in response to the available calcium source and quantity. The amount of calcium excreted in the urine ranges from 100 to 200 mg per day. The renal tubules reabsorb 98% to 99% of calcium as urine is conveyed. The distal tubule is the chief site for regulation of calcium excretion, and reabsorption of calcium in the distal tubule primarily occurs via the transcellular route. Calcium absorption in the kidney resembles that of the intestine, albeit with different molecular mediators. Specifically, kidney absorption processes include entry of calcium through TRPV5, cytosolic transfer of calcium by binding to CaBP-9K/CaBP-28K, and extrusion of calcium by the Na+/Ca2+ exchanger (NCX1) and PMCA1b1 [78-81]. CaBP-9K and CaBP-28K are coexpressed in the distal tubule. Because these factors exhibit potent calcium-binding capacities, CaBP-9K and CaBP-28K have been presumed to be vital for vitamin D–dependent regulation of calcium reabsorption in the kidney. When vitamin D–deficient mice are treated with 1,25(OH)2D3, both CaBP-9K and CaBP-28K are upregulated in the kidney . However, in wild-type (WT) mice fed a low-calcium (0.02%) or a high-calcium (2%) diet, the expression of CaBP-9K was increased or decreased, respectively, whereas the expression of CaBP-28K was unaffected. In rats, increased plasma calcium had no effect on the concentration of renal CaBP-28K . The effects of 1,25(OH)2D3/VDR on CaBP-9K/CaBP-28K are conditional. In primary renal tubular cells obtained from mice, CaBP-9K is tightly regulated by 1,25(OH)2D3 . In rats, the expression of renal CaBP-28K is increased by high levels of 1,25(OH)2D3 but is not sensitive to minor changes in 1,25(OH)2D3 . In VDR KO mice, investigators found a 90% reduction in renal CaBP-9K (compared with WT mice) but nearnormal renal expression of CaBP-28K . In 1α-hydroxylase KO mice, CaBP-9K and CaBP-28K both are reduced in the kidney . Therefore, vitamin D may control calcium reabsorption in the kidneys by affecting CaBP-28K independently of VDR. Research regarding the significance of CaBP-9K and CaBP-28K in renal calcium absorption is ongoing. Results of studies involving CaBP-9K KO mice and CaBP-28K KO mice suggest that CaBP-9K and CaBP-28K are redundant for urinary calcium reabsorption; these KO mice had normal serum calcium levels [86,87]. Other calcium transporters (eg, TRPV5/ TRPV6 and PMCA1b) may compensate for CaBP-9K during renal calcium reabsorption in mice . Findings with VDR KO mice and CaBP-9K/CaBP-28K double-KO mice indicate that CaBP-28K does not affect body calcium levels or renal calcium reabsorption; in contrast, CaBP-9K is tightly regulated by 1,25(OH)2D3/VDR and plays an important role in renal calcium reabsorption under calcium-deficient conditions [66,88]. When compared with VDR KO mice, VDR/CaBP-28K double-KO mice had higher urinary calcium excretion . CaBP-28K KO mice fed a high-calcium diet were found to have a 2- to 3-fold increase in urinary calcium . 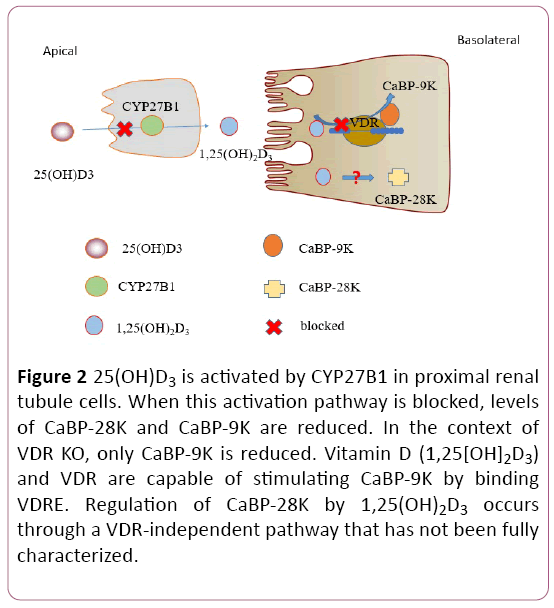 Thus, CaBP-28K may play a role in kidney calcium reabsorption by a VDR-independent process (Figure 2). Figure 2: 25(OH)D3 is activated by CYP27B1 in proximal renal tubule cells. When this activation pathway is blocked, levels of CaBP-28K and CaBP-9K are reduced. In the context of VDR KO, only CaBP-9K is reduced. Vitamin D (1,25[OH]2D3) and VDR are capable of stimulating CaBP-9K by binding VDRE. Regulation of CaBP-28K by 1,25(OH)2D3 occurs through a VDR-independent pathway that has not been fully characterized. CaBP-9K and CaBP-28K may exert indirect effects on paracellular calcium reabsorption, which is regulated by tightjunction proteins. Specifically, genes that encode tight junctions, such as ZO-1, CLDN1, CLDN4, CLDN5, CLDN10b, and CLDN16 can be differently upregulated in mice lacking CaBP-9K, CaBP-28K, or both CaBP-9K and CaBP-28K when the mice are fed a diet deficient in calcium or deficient in both calcium and vitamin D . In the regulation of kidney calcium homeostasis, CaBP-9K and CaBP-28K have complex, potentially important, roles that involve both intracellular and paracellular pathways. Vitamin D (1,25[OH]2D3) has crucial functions in bone calcium homeostasis . Calcium is a major constituent of bone, and bone constitutes the largest source of calcium in the body. Several hypotheses have been proposed regarding the function of 1,25(OH)2D3/VDR in bone. One is that 1,25(OH)2D3/VDR has bidirectional activities. A physiologically optimal concentration of 1,25(OH)2D3 may facilitate bone formation, whereas a deficiency or excess of 1,25(OH)2D3 may limit mineralization. Cyp24a1(25-hydroxyvitamin D-24- hydroxylase)-null mice exhibit intramembranous bone lesions; this defect is absent in Cyp24a1/VDR double-null mice. Hence, elevated 1,25(OH)2D3 interacting with VDR appears to produce bone defects [93,94]. Under normal conditions, 1,25(OH)2D3/VDR promotes mineralization and can produce anti-rickets effects in skeletal tissues. However, high-dose or prolonged treatment with 1,25(OH)2D3 can yield bone mineral loss and impaired mineralization [95-97]. Maternal hypervitaminosis D reduces fetal bone mass and mineral acquisition and can be lethal to the neonate . A deficiency in 1,25(OH)2D3 or the absence of VDR or CYP27B1 (25-hydroxyvitamin D-1 alpha hydroxylase) can lead to the rickets phenotype, characterized by reduced calcium binding in the bone matrix, decreased bone mineral density, and osteomalacia [20,21,67,95,96,99,100]. Proliferation of osteoblast-like osteosarcoma cells is stimulated at physiologic levels of 1,25(OH)2D3 (0.1 nM) but is hindered at higher doses (10 nM) [97-100]. Hence, physiologic levels of 1,25(OH)2D3 in bone appear to be tightly regulated such that an optimal level facilitates bone formation, and an imbalance in 1,25(OH)2D3 serves as an antimineralization signal. The functions of 1,25(OH)2D3 and VDR in bone depend on the calcium balance . If VDR is impaired in the intestine or if dietary intake of calcium is low (i.e., a negative calcium balance), VDR signaling in osteogenic cells produces increased bone resorption and impaired bone mineralization; this preserves serum calcium levels. In a mouse model of intestinal VDR deficiency, calcium is significantly mobilized from the bone to preserve normal serum calcium levels; this occurs via upregulation of the ratio of receptor activator of nuclear factor-κ B ligand (RANKL)/ osteoprotegerin(OPG) in osteoblasts to increase the generation of osteoclasts . In addition to stimulating bone resorption, 1,25(OH)2D3 inhibits bone matrix mineralization by upregulating Ennp1, Enpp3, and Ank; these factors increase pyrophosphate, a potent mineralization inhibitor [61,102,103]. If calcium levels are normal or elevated (ie, a positive calcium balance) and serum levels of 1,25(OH)2D3 are normal, intestinal calcium absorption is facilitated, and sufficient calcium is delivered for mineralization of bone matrix. Hence, the role of VDR signaling in bone cells during positive calcium balance involves maintenance of calcium homeostasis. The function of 1,25(OH)2D3/VDR in bone cells differs by cell type and stage. For instance, the effect of 1,25(OH)2D3/VDR in bone depends on the osteoblast differentiation stage. VDR signaling in osteoprogenitors and osteoblasts induces osteoclast formation and bone resorption; this negatively regulates bone mass . In mature osteoblasts, VDR increases bone mass by decreasing the ratio of RANKL/OPG and increasing LRP-5 expression [105-107]. VDR signaling in osteocytes may be redundant because VDR inactivation has no effect on mature osteoblasts or osteocytes in terms of bone mass and mineralization . Because these differentiation stages coexist, the functions of VDR signaling in osteogenic cells are complex and warrant further investigation. CaBP-9K and CaBP-28K have been found in calciumtransporting epithelia and are co-expressed in mineralized tissues-such as ameloblasts, odontoblasts, osteoblasts, and osteocytes—as well as in chondrocytes [12,108-110]. CaBP-28K inhibits the apoptosis of osteoblast cells . The roles of CaBP-9K and CaBP-28K in calcium regulation in vivo have been assessed by means of CaBP-9K KO mice and CaBP-28K KO mice. These KO mice have a phenotype that resembles that of WT mice, and the growth, life span, serum calcium levels, and serum phosphate levels of the KO mice are within normal ranges [87,112]. Results of early studies in this field suggested that CaBP-9K and CaBP-28K were of minor importance in calcium homeostasis because they could be functionally substituted by other calcium transporters. Subsequent findings involving CaBP-9K and CaBP-28K double-KO mice were that the mice appeared normal under conditions of normal dietary intake of calcium; however, under calcium-deficient conditions, the double-KO mice had more decreased serum calcium levels and bone length than did WT mice . More recent work involved VDR/CaBP-D28K double-KO mice. Compared with VDR KO mice, VDR/CaBP-28K double-KO mice exhibit worsened growth retardation, lower body weight, and a more severe rachitic skeletal phenotype. When fed a normal diet, the double-KO mice had lower bone mineral density and a more distorted growth plate, with more osteoid formation in the trabecular region. When both VDR KO mice and VDR/CaBP-28K double- KO mice were fed a high-calcium, high-lactose diet, serum calcium levels were normalized in both the VDR KO and the double-KO mice, whereas skeletal abnormalities were resolved in the VDR KO mice but not in the double-KO mice . The phenotypes of different gene KO mice were showed below (Table 1). Table 1: The phenotypes of different gene KO mice were showed. In research involving CaBP-28K KO mice, significantly increased femora and tibia cortical bone volumes were noted . These effects resulted from a decrease in the marrow cavity area, significantly decreased endosteal perimeters, and an increased trabecular number, compared with WT mice. CaBP-28K KO mice had stiffer bones, increased failure loads, and a decreased ratio of bone surface to bone volume, compared with WT mice. CaBP-28K KO mice also had decreased serum osteocalcin, which is an indicator of bone formation rate . The increased bone volume and stiffness and decreased bone formation rate among CaBP-28K KO mice indicated that CaBP-28K plays an important role in bone homeostasis . These results demonstrate that CaBP-9K and especially CaBP-28K are vital contributors to bone calcium homeostasis and skeletal mineralization . Advancements in our understanding of calcium balance in bone development likely will hinge on clarification of the regulatory processes between 1,25(OH)2D3/VDR and CaBP-9K/CaBP-28K. Vitamin D (1,25[OH]2D3) and calcium are maintained in balance, at least in part, by CaBP-9K and CaBP-28K. Intestinal calcium absorption involves participation of CaBP-28K in the vesicular transport pathway, which is regulated by 1,25(OH)2D3/VDR but is not well understood. In maintenance of kidney calcium, CaBP-9K appears to be regulated directly by 1,25(OH)2D3/VDR, whereas CaBP-28K participates in calcium regulation via a poorly characterized, 1,25(OH)2D3-dependent and VDR-independent manner. In bone, CaBP-28K regulates development of the growth plate and can affect bone formation and mineralization. Additional work involving the relationship of CaBP-9K/CaBP-28K with 1,25(OH)2D3/VDR during calcium homeostasis is warranted and may offer insight regarding the diagnosis and treatment of vitamin D- and calcium-imbalance diseases. This study was supported by grants from National Natural Science Foundation of China (No. 8157090624, No. 81271938) and the Liaoning Province Science and Technology Project (No. 2013225079). Mitchell DM, Juppner H (2010) Regulation of calcium homeostasis and bone metabolism in the fetus and neonate. Current Opinion Endocrinol Diab Obesity 17: 25-30. Schwaller B (2010) Cytosolic Ca2+ buffers. Cold Spring Harbor Perspectives Biol 2: a004051. Gkika D, Hsu YJ, Van der Kemp AW, Christakos S, Bindels RJ, et al. (2006) Critical role of the epithelial Ca2+ channel TRPV5 in active Ca2+ reabsorption as revealed by TRPV5/calbindin-D28K knockout mice. J Am Society Nephrol: JASN 17: 3020-3027. Benn BS, Ajibade D, Porta A, Dhawan P, Hediger M, et al. (2008) Active intestinal calcium transport in the absence of transient receptor potential vanilloid type 6 and calbindin-D9k. Endocrinol 149: 3196-3205. Mohamed TM, Baudoin-Stanley FM, Abou-Leisa R, Cartwright E, Neyses L, et al. (2010) Measurement of plasma membrane calcium-calmodulin-dependent ATPase (PMCA) activity. Methods Mol Biol 637: 333-342. Caillard O, Moreno H, Schwaller B, Llano I, Celio MR, et al. (2000) Role of the calcium-binding protein parvalbumin in short-term synaptic plasticity. Proceedings of the National Academy of Sciences of the United States of America 97: 13372-13377. Choi KC, Jeung EB (2008) Molecular mechanism of regulation of the calcium-binding protein calbindin-D9k, and its physiological role(s) in mammals: A review of current research. J Cell Mol Med 12: 409-420. Bearzatto B, Servais L, Roussel C, Gall D, Baba-Aissa F, et al. (2006) Targeted calretinin expression in granule cells of calretinin-null mice restores normal cerebellar functions. FASEB journal: Official publication of the Federation of American Societies for Experimental Biology 20: 380-382. Suzuki Y, Kovacs CS, Takanaga H, Peng JB, Landowski CP, et al. (2008) Calcium channel TRPV6 is involved in murine maternal-fetal calcium transport. Journal of Bone and Mineral Research: The Official Journal of the American Society for Bone and Mineral Research 23: 1249-1256. Wakimoto K, Kuro-o M, Yanaka N, Komuro I, Nabeshima YI, et al. (2001) Expression of Na+/Ca2+ exchanger (NCX1) gene in the developmental mouse embryo and adult mouse brain. Comparative biochemistry and physiology Part B, Biochem Mol Biol 130: 191-198. Ingersoll RJ, Wasserman RH (1971) Vitamin D3-induced calcium-binding protein. Binding characteristics, conformational effects, and other properties. J Biol Chem 246: 2808-2814. Balmain N, Berdal A, Hotton D, Cuisinier-Gleizes P, Mathieu H (1989) Calbindin-D9K immunolocalization and vitamin D-dependence in the bone of growing and adult rats. Histochem 92: 359-365. Carmeliet G, Dermauw V, Bouillon R (2015) Vitamin D signaling in calcium and bone homeostasis: A delicate balance. Best practice Res Clin Endocrinol Metabol 29: 621-631. Ebeling PR (2014) Vitamin D and bone health: Epidemiologic studies. BoneKEy reports 2014, 3. Jones G, Strugnell SA, DeLuca HF (1998) Current understanding of the molecular actions of vitamin D. Physiol Reviews 78: 1193-1231. Haussler MR, McCain TA (1977) Basic and clinical concepts related to vitamin D metabolism and action (first of two parts). The New England J Med 297: 974-983. Christakos S, Dhawan P, Benn B, Porta A, Hediger M, et al. (2007) Vitamin D: molecular mechanism of action. Annals New York Acad Sci 1116: 340-348. Christakos S, Veldurthy V, Patel N, Wei R (2017) Intestinal Regulation of Calcium: Vitamin D and Bone Physiology. Advances Exp Med Biol 1033: 3-12. Brumbaugh PF, Haussler MR (1975) Specific binding of 1 alpha, 25-dihydroxycholecalciferol to nuclear components of chick intestine. J Biol Chem 250: 1588-1594. Yoshizawa T, Handa Y, Uematsu Y, Takeda S, Sekine K, et al. (1997) Mice lacking the vitamin D receptor exhibit impaired bone formation, uterine hypoplasia and growth retardation after weaning. Nature Genetics 16: 391-396. Li YC, Pirro AE, Amling M, Delling G, Baron R, et al. (1997) Targeted ablation of the vitamin D receptor: an animal model of vitamin D-dependent rickets type II with alopecia. Proceedings of the National Academy of Sciences of the United States of America 94: 9831-9835. Taylor AN, Wasserman RH (1967) Vitamin D3-induced calcium-binding protein: partial purification, electrophoretic visualization, and tissue distribution. Archi Biochem Biophy 119: 536-540. Wasserman RH, Taylor AN (1966) Vitamin d3-induced calcium-binding protein in chick intestinal mucosa. Science 152: 791-793. Kallfelz FA, Taylor AN, Wasserman RH (1967) Vitamin D-induced calcium binding factor in rat intestinal mucosa. Proceedings of the Society for Experimental Biology and Medicine Society for Experimental Biology and Medicine 125: 54-58. Kawasaki H, Nakayama S, Kretsinger RH (1998) Classification and evolution of EF-hand proteins. Biometals: an international Journal on the Role of Metal Ions in Biology, Biochemistry and Medicine 11: 277-295. Marenholz I, Heizmann CW, Fritz G (2004) S100 proteins in mouse and man: from evolution to function and pathology (including an update of the nomenclature). Biochem Biophys Res Communications 322: 1111-1122. Schwaller B (2009) The continuing disappearance of "pure" Ca2+ buffers. Cellular and molecular life sciences: CMLS 66: 275-300. Perret C, Lomri N, Thomasset M (1989) Structure of the rat vitamin D-induced calbindin-D9K gene and evolution of the EF-hand calcium-binding protein family. Advances In Exp Med Biol 255: 241-250. Jeung EB, Krisinger J, Dann JL, Leung PC (1992) Molecular cloning of the full-length cDNA encoding the human calbindin-D9k. FEBS letters 307: 224-228. Parmentier M (1990) Structure of the human cDNAs and genes coding for calbindin D28K and calretinin. Advances Exp Med Biol 269: 27-34. Armbrecht HJ, Boltz M, Strong R, Richardson A, Bruns ME, et al. (1989) Expression of calbindin-D decreases with age in intestine and kidney. Endocrinol 125: 2950-2956. Mathieu CL, Mills SE, Burnett SH, Cloney DL, Bruns DE, et al. (1989) The presence and estrogen control of immunoreactive calbindin-D9k in the fallopian tube of the rat. Endocrinol 125: 2745-2750. Seifert MF, Gray RW, Bruns ME (1988) Elevated levels of vitamin D-dependent calcium-binding protein (calbindin-D9k) in the osteosclerotic (oc) mouse. Endocrinol 122: 1067-1073. Mathieu CL, Burnett SH, Mills SE, Overpeck JG, Bruns DE, et al. (1989) Gestational changes in calbindin-D9k in rat uterus, yolk sac, and placenta: implications for maternal-fetal calcium transport and uterine muscle function. Proceedings of the National Academy of Sciences of the United States of America 86: 3433-3437. McIntosh JE, Bourdeau JE, Taylor AN (1986) Immunohistochemical localization of calbindin-D28k during the development of the rabbit nephron. The Anatomical record 215: 383-389. Hall AK, Bishop JE, Norman AW (1987) Inhibitory and stimulatory effects of dexamethasone and 1,25-dihydroxyvitamin D3 on chick intestinal calbindin-D28K and its mRNA. Mol Cell Endocrinol 51: 25-31. Iacopino AM, Christakos S (1990) Corticosterone regulates calbindin-D28k mRNA and protein levels in rat hippocampus. J Biol Chem 265: 10177-10180. Hall AK, Norman AW (1991) Acute actions of 1,25-dihydroxyvitamin D3 upon chick pancreatic calbindin-D28K. Biochemi Biophys Res Communications 176: 1057-1061. Faucheux C, Bareille R, Amedee J (1998) Synthesis of calbindin-D28K during mineralization in human bone marrow stromal cells. Biochem J 333: 817-823. Onishi T, Shintani S, Wakisaka S, Ooshima T (2008) Relationship of vitamin D with calbindin D9k and D28k expression in ameloblasts. Archives Oral Biol 53: 117-123. Theofan G, Norman AW (1986) Effects of alpha-amanitin and cycloheximide on 1,25-dihydroxyvitamin D3-dependent calbindin-D28K and its mRNA in vitamin D3-replete chick intestine. J Biol Chem 261: 7311-7315. Hermanowicz-Sobieraj B, Bogus-Nowakowska K, Robak A (2018) Calcium-binding proteins expression in the septum and cingulate cortex of the adult guinea pig. Annals of anatomy = Anatomischer Anzeiger: Official organ of the Anatomische Gesellschaft 215: 30-39. Beggs MR, Appel I, Svenningsen P, Skjodt K, Alexander RT, et al. (2017) Expression of transcellular and paracellular calcium and magnesium transport proteins in renal and intestinal epithelia during lactation. Am J Physiol Renal Physiol313: 629-640. Dupret JM, L'Horset F, Perret C, Bernaudin JF, Thomasset M (1992) Calbindin-D9K gene expression in the lung of the rat. Absence of regulation by 1,25-dihydroxyvitamin D3 and estrogen. Endocrinol 131: 2643-2648. L'Horset F, Blin C, Brehier A, Thomasset M, Perret C (1993) Estrogen-induced calbindin-D 9k gene expression in the rat uterus during the estrous cycle: late antagonistic effect of progesterone. Endocrinol 132: 489-495. Delorme AC, Danan JL, Acker MG, Ripoche MA, Mathieu H (1983) In rat uterus 17 beta-estradiol stimulates a calcium-binding protein similar to the duodenal vitamin D-dependent calcium-binding protein. Endocrinol 113: 1340-1347. Hall AK, Norman AW (1991) Vitamin D-independent expression of chick brain calbindin-D28K. Brain research Molecular brain research 9: 9-14. Bronner F, Pansu D, Stein WD (1986) An analysis of intestinal calcium transport across the rat intestine. Am J Physiol 250: 561-569. Lieben L, Benn BS, Ajibade D, Stockmans I, Moermans K, et al. (2010) Trpv6 mediates intestinal calcium absorption during calcium restriction and contributes to bone homeostasis. Bone 47: 301-308. Davis WL, Jones RG, Hagler HK (1979) Calcium containing lysosomes in the normal chick duodenum: a histochemical and analytical electron microscopic study. Tissue & Cell 11: 127-138. Davis WL, Jones RG (1981) Calcium lysosomes in rachitic and vitamin D3 replete chick duodenal absorptive cells. Tissue & Cell 13: 381-391. Nemere I, Norman AW (1988) 1,25-Dihydroxyvitamin D3-mediated vesicular transport of calcium in intestine: Time-course studies. Endocrinol 122: 2962-2969. Nemere I, Norman AW (1989) 1,25-Dihydroxyvitamin D3-mediated vesicular calcium transport in intestine: dose-response studies. Mol Cell Endocrinol 67: 47-53. Bouillon R, Carmeliet G, Verlinden L, Van Etten E, Verstuyf A, et al. (2008) Vitamin D and human health: Lessons from vitamin D receptor null mice. Endocrine reviews 29: 726-776. Nemere I, Norman AW (1990) Transcaltachia, vesicular calcium transport, and microtubule-associated calbindin-D28K: emerging views of 1,25-dihydroxyvitamin D3-mediated intestinal calcium absorption. Mineral Electrolyte Metabol 16: 109-114. Haussler MR, Whitfield GK, Haussler CA, Hsieh JC, Thompson PD, et al. (1998) The nuclear vitamin D receptor: biological and molecular regulatory properties revealed. Journal of Bone and Mineral Research: The Official Journal of the American Society for Bone and Mineral Research 13: 325-349. Wasserman RH (2004) Vitamin D and the dual processes of intestinal calcium absorption. J Nutri 134: 3137-3139. Christakos S, Dhawan P, Porta A, Mady LJ, Seth T (2011) Vitamin D and intestinal calcium absorption. Mol Cellular Endocrinol 347: 25-29. Van Cromphaut SJ, Dewerchin M, Hoenderop JG, Stockmans I, Van Herck E, et al. (2001) Duodenal calcium absorption in vitamin D receptor-knockout mice: functional and molecular aspects. Proceedings of the National Academy of Sciences of the United States of America 98: 13324-13329. Song Y, Kato S, Fleet JC (2003) Vitamin D receptor (VDR) knockout mice reveal VDR-independent regulation of intestinal calcium absorption and ECaC2 and calbindin D9k mRNA. J Nutri 133: 374-380. Lieben L, Masuyama R, Torrekens S, Van Looveren R, Schrooten J, et al. (2012) Normocalcemia is maintained in mice under conditions of calcium malabsorption by vitamin D-induced inhibition of bone mineralization. J Clin Invest 122: 1803-1815. Harris F, Hoffenberg R, Black E (1965) Calcium kinetics in vitamin D deficiency rickets. II. Intestinal handling of calcium. Metabol 14: 1112-1121. Christakos S, Gabrielides C, Rhoten WB (1989) Vitamin D-dependent calcium binding proteins: chemistry, distribution, functional considerations, and molecular biology. Endocrine Reviews 10: 3-26. Jeung EB, Krisinger J, Dann JL, Leung PC (1992) Cloning of the porcine Calbindin-D9k complementary deoxyribonucleic acid by anchored polymerase chain reaction technique. Biol Reproduction 47: 503-508. Darwish HM, DeLuca HF (1992) Identification of a 1,25-dihydroxyvitamin D3-response element in the 5'-flanking region of the rat calbindin D-9k gene. Proceedings of the National Academy of Sciences of the United States of America 89: 603-607. Li YC, Bolt MJ, Cao LP, Sitrin MD (2001) Effects of vitamin D receptor inactivation on the expression of calbindins and calcium metabolism. Am J Physiol Endocrinol Metabolism 281: E558-564. Dardenne O, Prud'homme J, Arabian A, Glorieux FH, St-Arnaud R (2001) Targeted inactivation of the 25-hydroxyvitamin D(3)-1(alpha)-hydroxylase gene (CYP27B1) creates an animal model of pseudovitamin D-deficiency rickets. Endocrinol 142: 3135-3141. Li YC, Pirro AE, Demay MB (1998) Analysis of vitamin D-dependent calcium-binding protein messenger ribonucleic acid expression in mice lacking the vitamin D receptor. Endocrinol 139: 847-851. Walters JR, Howard A, Charpin MV, Gniecko KC, Brodin P, et al. (1990) Stimulation of intestinal basolateral membrane calcium-pump activity by recombinant synthetic calbindin-D9k and specific mutants. Biochem Biophys Res Communications 170: 603-608. Bar A, Shani M, Fullmer CS, Brindak ME, Striem S (1990) Modulation of chick intestinal and renal calbindin gene expression by dietary vitamin D3, 1,25-dihydroxyvitamin D3, calcium and phosphorus. Mol Cell Endocrinol 72: 23-31. Bolt MJ, Cao LP, Kong J, Sitrin MD, Li YC (2005) Vitamin D receptor is required for dietary calcium-induced repression of calbindin-D9k expression in mice. J Nutri Biochem16: 286-290. Lee GS, Choi KC, Park SM, An BS, Cho MC, et al. (2003) Expression of human Calbindin-D9k correlated with age, vitamin D receptor and blood calcium level in the gastrointestinal tissues. Clin Biochem 36: 255-261. Armbrecht HJ, Zenser TV, Davis BB (1980) Effect of vitamin D metabolites on intestinal calcium absorption and calcium-binding protein in young and adult rats. Endocrinol 106: 469-475. Lee GS, Lee KY, Choi KC, Ryu YH, Paik SG, et al. (2007)Phenotype of a calbindin-D9k gene knockout is compensated for by the induction of other calcium transporter genes in a mouse model. Journal of Bone and Mineral Research: The Official Journal of the American Society for Bone and Mineral Research 22: 1968-1978. Van Cromphaut SJ, Rummens K, Stockmans I, Van Herck E, Dijcks FA, et al. (2003) Intestinal calcium transporter genes are upregulated by estrogens and the reproductive cycle through vitamin D receptor-independent mechanisms. Journal of Bone and Mineral Research: The Official Journal of the American Society for Bone and Mineral Research 18: 1725-1736. Song Y, Peng X, Porta A, Takanaga H, Peng JB, et al. (2003) Calcium transporter 1 and epithelial calcium channel messenger ribonucleic acid are differentially regulated by 1,25 dihydroxyvitamin D3 in the intestine and kidney of mice. Endocrinol 144: 3885-3894. Nemere I, Leathers V, Norman AW (1986) 1,25-Dihydroxyvitamin D3-mediated intestinal calcium transport. Biochemical identification of lysosomes containing calcium and calcium-binding protein (calbindin-D28K). J Biol Chem 261: 16106-16114. Blaine J, Chonchol M, Levi M (2015) Renal control of calcium, phosphate, and magnesium homeostasis. Clinical journal of the American Society of Nephrol: CJASN 10: 1257-1272. Lambers TT, Bindels RJ, Hoenderop JG (2006) Coordinated control of renal Ca2+ handling. Kidney international 69: 650-654. Hoenderop JG, Nilius B, Bindels RJ (2002) Molecular mechanism of active Ca2+ reabsorption in the distal nephron. Ann Rev Physiol 64: 529-549. Mensenkamp AR, Hoenderop JG, Bindels RJ (2006) Recent advances in renal tubular calcium reabsorption. Current Opinion in Nephrology and Hypertension 15: 524-529. Li H, Christakos S (1991) Differential regulation by 1,25-dihydroxyvitamin D3 of calbindin-D9k and calbindin-D28k gene expression in mouse kidney. Endocrinol 128: 2844-2852. Hemmingsen C, Staun M, Nielsen PK, Olgaard K (2002) Separate effects of 1,25-dihydroxyvitamin D and calcium on renal calbindin-D28k and intestinal calbindin-D9k. Pharmacol Toxicol 91: 111-115. Cao LP, Bolt MJ, Wei M, Sitrin MD, Chun Li Y (2002) Regulation of calbindin-D9k expression by 1,25-dihydroxyvitamin D(3) and parathyroid hormone in mouse primary renal tubular cells. Archi Biochem Biophy 400: 118-124. Hoenderop JG, Dardenne O, Van AM, Van Der Kemp AW, Van Os CH, et al. (2002) Modulation of renal Ca2+ transport protein genes by dietary Ca2+ and 1,25-dihydroxyvitamin D3 in 25-hydroxyvitamin D3-1alpha-hydroxylase knockout mice. FASEB journal: official publication of the Federation of American Societies for Experimental Biology 16: 1398-1406. Akhter S, Kutuzova GD, Christakos S, DeLuca HF (2007) Calbindin D9k is not required for 1,25-dihydroxyvitamin D3-mediated Ca2+ absorption in small intestine. Archi Biochem Biophy 460: 227-232. Airaksinen MS, Eilers J, Garaschuk O, Thoenen H, Konnerth A, et al. (1997) Ataxia and altered dendritic calcium signaling in mice carrying a targeted null mutation of the calbindin D28k gene. Proceedings of the National Academy of Sciences of the United States of America 94: 1488-1493. Ko SH, Choi KC, Oh GT, Jeung EB (2009) Effect of dietary calcium and 1,25-(OH)2D3 on the expression of calcium transport genes in calbindin-D9k and -D28k double knockout mice. Biochem Biophys Res Communications 379: 227-232. Zheng W, Xie Y, Li G, Kong J, Feng JQ (2004) Critical role of calbindin-D28k in calcium homeostasis revealed by mice lacking both vitamin D receptor and calbindin-D28k. J Biol Chem 279: 52406-52413. Sooy K, Kohut J, Christakos S (2000) The role of calbindin and 1,25dihydroxyvitamin D3 in the kidney. Current Opinion Nephrol Hypertension 9: 341-347. Hwang I, Hong EJ, Yang H, Kang HS, Ahn C, et al. (2014) Regulation of tight junction gene expression in the kidney of calbindin-D9k and/or -D28k knockout mice after consumption of a calcium- or a calcium/vitamin D-deficient diet. BMC biochem 15:6. Zhu T, Liu TJ, Ge X, Kong J, Zhang LJ, et al. (2015) High prevalence of maternal vitamin D deficiency in preterm births in northeast China, Shenyang. Int J Clin Exp Pathol 8: 1459-1465. Masuda S, Byford V, Arabian A, Sakai Y, Demay MB, et al. (2005) Altered pharmacokinetics of 1alpha,25-dihydroxyvitamin D3 and 25-hydroxyvitamin D3 in the blood and tissues of the 25-hydroxyvitamin D-24-hydroxylase (Cyp24a1) null mouse. Endocrinol 146: 825-834. Arnaud RS, Arabian A, Travers R, Barletta F, Raval PM, et al. (2000) Deficient mineralization of intramembranous bone in vitamin D-24-hydroxylase-ablated mice is due to elevated 1,25-dihydroxyvitamin D and not to the absence of 24,25-dihydroxyvitamin D. Endocrinol 141: 2658-2666. Amling M, Priemel M, Holzmann T, Chapin K, Rueger JM, et al. (1999) Rescue of the skeletal phenotype of vitamin D receptor-ablated mice in the setting of normal mineral ion homeostasis: formal histomorphometric and biomechanical analyses. Endocrinol140: 4982-4987. Li YC, Amling M, Pirro AE, Priemel M, Meuse J, et al. (1998) Normalization of mineral ion homeostasis by dietary means prevents hyperparathyroidism, rickets, and osteomalacia, but not alopecia in vitamin D receptor-ablated mice. Endocrinol 139: 4391-4396. Wronski TJ, Halloran BP, Bikle DD, Globus RK, Morey Holton ER (1986) Chronic administration of 1,25-dihydroxyvitamin D3: increased bone but impaired mineralization. Endocrinol 119: 2580-2585. Lieben L, Stockmans I, Moermans K, Carmeliet G (2013) Maternal hypervitaminosis D reduces fetal bone mass and mineral acquisition and leads to neonatal lethality. Bone 57: 123-131. Panda DK, Miao D, Bolivar I, Li J, Huo R, et al. (2004) Inactivation of the 25-hydroxyvitamin D 1alpha-hydroxylase and vitamin D receptor demonstrates independent and interdependent effects of calcium and vitamin D on skeletal and mineral homeostasis. J Biol Chem 279: 16754-16766. Panda DK, Miao D, Tremblay ML, Sirois J, Farookhi R, et al. (2001) Targeted ablation of the 25-hydroxyvitamin D 1alpha -hydroxylase enzyme: evidence for skeletal, reproductive, and immune dysfunction. Proceedings of the National Academy of Sciences of the United States of America 98: 7498-7503. Luo W, Liu L, Yang L, Dong Y, Liu T, et al. (2009) The vitamin D receptor regulates miR-140-5p and targets the MAPK pathway in bone development. Metabol 2018, 85:139-150. Golub EE: Role of matrix vesicles in biomineralization. Biochimica Et Biophysica Acta 1790: 1592-1598. Meyer MB, Benkusky NA, Lee CH, Pike JW (2014) Genomic determinants of gene regulation by 1,25-dihydroxyvitamin D3 during osteoblast-lineage cell differentiation. J Biol Chem 289: 19539-19554. Yamamoto Y, Yoshizawa T, Fukuda T, Shirode FY, Yu T, et al. (2013) Vitamin D receptor in osteoblasts is a negative regulator of bone mass control. Endocrinol 154: 1008-1020. Baldock PA, Thomas GP, Hodge JM, Baker SU, Dressel U, et al. (2006) Vitamin D action and regulation of bone remodeling: suppression of osteoclastogenesis by the mature osteoblast. Journal of Bone and Mineral Research: The Official Journal of the American Society for Bone and Mineral Research 21: 1618-1626. Fretz JA, Zella LA, Kim S, Shevde NK, Pike JW (2006) 1,25-Dihydroxyvitamin D3 regulates the expression of low-density lipoprotein receptor-related protein 5 via deoxyribonucleic acid sequence elements located downstream of the start site of transcription. Mol Endocrinol 20: 2215-2230. Gardiner EM, Baldock PA, Thomas GP, Sims NA, Henderson NK, et al. (2000) Increased formation and decreased resorption of bone in mice with elevated vitamin D receptor in mature cells of the osteoblastic lineage. FASEB Journal: Federation Am Soc Exp Biol 14: 1908-1916. Balmain N, Brehier A, Cuisinier GP, Mathieu H (1986) Evidence for the presence of Calbindin-D 28K (CaBP-28K) in the tibial growth cartilages of rats. Cell Tissue Res 245: 331-335. Buffa R, Mare P, Salvadore M, Gini A (1990) Immunohistochemical detection of 28KDa calbindin in human tissues. Advances Exp Med Biol 269: 205-210. Berdal A, Hotton D, Saffar JL, Thomasset M, Nanci A (1996) Calbindin-D9k and Calbindin-D28kExpression in Rat Mineralized Tissues In Vivo Journal of Bone and Mineral Research: The Official Journal of the American Society for Bone and Mineral Research 11: 768-779. Bellido T (2000) Calbindin-D28k Is Expressed in Osteoblastic Cells and Suppresses Their Apoptosis by Inhibiting Caspase-3 Activity. J Biol Chem 275: 26328-26332. Kutuzova GD, Akhter S, Christakos S, Vanhooke J, Kimmel JC, et al. (2006) Calbindin D(9k) knockout mice are indistinguishable from wild-type mice in phenotype and serum calcium level. Proceedings of the National Academy of Sciences of the United States of America 103: 12377-12381. Lee CT, Huynh VM, Lai LW, Lien YH (2002) Cyclosporine A-induced hypercalciuria in calbindin-D28k knockout and wild-type mice. Kidney Int 62: 2055-2061. Margolis DS, Kim D, Szivek JA, Lai LW, Lien YHH (2006) Functionally improved bone in Calbindin-D28k knockout mice. Bone 39: 477-484. Yang LP, Dong YP, Luo WT, Zhu T, Li QW, et al. (2018) Calbindin-D28K mediates 25(OH)D3/VDR-regulated bone formation through MMP13 and DMP1. J Cell Biochem 119: 8035-8047.